I’ve finally finished reading Ivan Ristic’s new book, mod_security handbook, published by Feisty Duck. Ivan is the brain behind mod_security. By the way, if you’re not using mod_security on your Apache server, you should be. And this is the book to tell you how to use it. Ivan sent me a few early releases of the book, and about a month ago I received the first print edition. 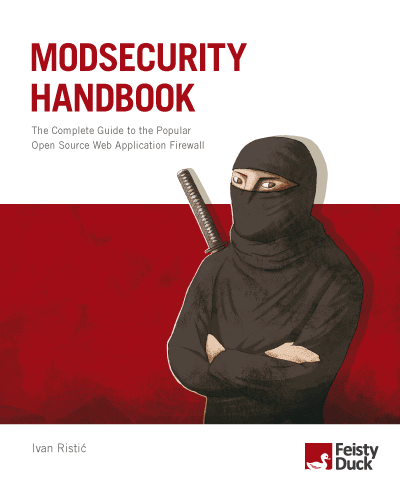 This book is what you’ve been waiting for if you use mod_security. (And, as I mentioned, if you’re not using it, you should be.) The documentation for mod_security has long been frustrating. Even where it was complete and informative, you just didn’t know where to start. This book is where to start. The first 2/3 of the book is written in tutorial fashion, walking you through tasks from installation to complex scripting. Chapter 6 gives a great description of writing rules, and Chapter 9 gives numerous practical examples which flesh out what goes before. I always learn best by example, so these examples and the accompanying explanations make the earlier academic learning more meaningful to me. Chapter 8 is about persistent storage of data. I’ve long been interested in this area of mod_security, and have had many times when I needed it and didn’t understand the docs on it. Ivan makes it much clearer than I’ve seen it presented before. I’ll be looking back at this the next time the need arises to do this kind of thing. The last third of the book is the reference manual. I’m a big fan of having the reference manual in printed format, although it does run the risk of being out of date quickly. This book is constantly updated, so you can always obtain the latest version. However, it’s unlikely that I’ll be buying a new paper book each time there’s a new release of mod_security. This book is also available in electronic format, and if you buy the ebook, you get updates to it as part of your purchase price. That’s pretty cool. On the whole, this book is a long-awaited resource, and is very well written, by the person who knows the topic best. Highly recommended. You should go get a copy right away.